Elipson announces flagship Omega Carbon Black turntable | What Hi-Fi? Considering Elipson only entered the turntable arena quite recently, it’s done well to shout above the market’s noise with a range of solidly performing midrange decks. Both the brand’s Alpha 100 RIAA (£300) and Omega 100 RIA BT (£500) models have garnered four-star reviews from us - and the new Omega Carbon Black looks its most ambitious deck to date. As the name may suggest, it’s based on the brand’s Omega 100. But, as you’d expect for a flagship model, it features a number of enhancements. For starters, the use of carbon fibre has been extended from the tone-arm to the sub-chassis to offer greater rigidity. There’s also a new Ortofon 2M Red cartridge, and an aluminum lever has been added with the aim of improving user experience. As with the Alpha and Omega turntables, the Omega Carbon Black is available in two versions. 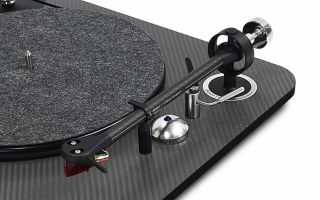 The Omega 100 RIAA BT Carbon Black (£700) features a built-in pre-amp, aptX Bluetooth connectivity and a USB output that - like the Audio Technica AT-LP5 and Sony PS-HX500 - lets you digitise your vinyl collection. The Omega 100 Carbon Black (£550), meanwhile, is a more stripped-back affair and goes without those extra features to keep costs down. The Omega 100 RIAA BT Carbon Black and Omega 100 Carbon Black will be available in September, which is hopefully around the time we'll get our first listen to it.